Spanish multi-national paper and packaging manufacturer SAICA has started production at its new £300m recycled paper mill in Trafford. The company, which won permission for the factory in 2008, said it was the first new paper mill to be built in the UK for decades. It will use recovered paper from the UK to produce 400,000 tonnes of 100% recycled containerboard each year. SAICA says this will reduce carbon emissions by 84,011 tonnes a year by cutting the amount of used paper that is sent for export by 450,000 tonnes a year. The site at Partington also has a combined heat and power station and an advanced effluent treatment plant. 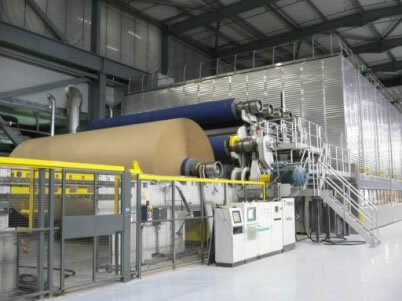 Erkki Savolainen, project director for the mill, said: “Everybody involved in the project is delighted that we have been able to produce paper here in Partington ahead of schedule. SAICA is a family-owned Spanish company which employs 8,000 people in Spain, France, Portugal, Italy, Ireland and the UK. It has an annual turnover of £1.5bn. An initial appointment of FOB Work to provide Architectural Services to the lead-consultant, Poyry, included the detailed design of the offices and co-ordination of cladding across this project. The ability to ensure a seamless integration of the architectural detailing with engineering process culminated in FOB, lead by Technical Director, Neil Price, working directly for the client, SAICA on a range of operational buildings, offices and workshops. The role included liaison with specialist-subcontractors and project management. Print article This entry was posted by Neil Price on January 26, 2012 at 9:56 am, and is filed under Work. Follow any responses to this post through RSS 2.0. Both comments and pings are currently closed.